Ready to dump the pushing? 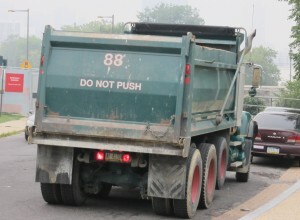 Once, driving down the freeway, I got behind a dump truck that had the words “Do Not Push” on the tailgate. It looked like the Tao on wheels. For those who may not be familiar with the Tao te Ching, it’s an ancient Chinese wisdom text–one of my favorite pieces of spiritual writing–which emphasizes living in accord with the Tao (roughly translated “the Way”), the guiding principle of the Universe. Do you ever feel trapped in thought? This summer they were renovating the grounds of the Rodin Museum here in Philadelphia where the largest collection of Rodin sculptures outside Paris reside. One of the casts of Rodin’s renowned statue The Thinker sits in the courtyard entrance to the museum. 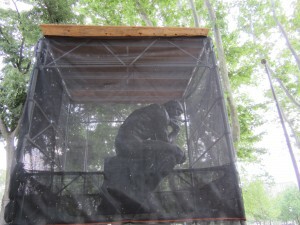 In order to protect it during the renovations, they enclosed the sculpture in a mesh cage. Do we have the courage to bless and share? One day I was riding the bus back home from Center City. We had pulled over at a stop to let some passengers on, and it was taking much longer than usual. Curious, I looked out the window and saw that a couple of people were trying to help a woman onto the bus. When the woman boarded, wearing dark glasses and carrying a white cane, I understood the delay. She sat down up front, and the woman following her sat down next to me. “We’ve got to look out for one another,” she told me. It seemed the driver hadn’t noticed the blind woman, so this woman and her husband had intervened. Let me pause to interject an important contextual note. The blind woman was white. The woman sitting next to me was Black. I’m white. None of which should matter, except that in a society still divided along lines of race, it does. Then she laughed, her face beaming. “Or maybe we’re all descended from the apes.” From the same apes, that is. “We’re all in the same boat,” I replied, offering up my feeble cliche and marveling at the incredible encounters one can have on public transportation. Then she started telling me a story. She ran into a woman once who had gone through some terrible struggles. She was down on her luck with no place to go and no money. My bus companion had only forty dollars herself, but she took out twenty and gave it to the woman. Later on that day, something drew her attention to a listing of winning lottery numbers. She noticed one that she was sure she had played recently. She went fishing for her ticket and sure enough, she’d won $250. She was certain she never would have discovered it if she hadn’t given the twenty away. As we spoke, I remembered the story about Jesus wanting to feed a hungry crowd out in the middle of nowhere and asking the disciples how much food they had. Five loaves of bread and two fish. Enough for the thirteen of them and their inner circle of friends to have a meager meal, but nowhere near enough for a crowd of thousands. Jesus seemed completely immune to their scarcity mentality. He took the bread, blessed it, broke it, shared it. His trust, expressed through that act of generosity, unleashed their collective abundance. The hungry masses were fed. 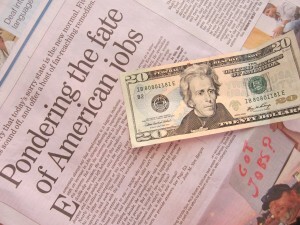 Some people look at that story as a demonstration of Jesus’ greatness as a miracle worker, but I see it differently. For one thing, I don’t believe Jesus was at all interested in demonstrating his greatness. If he had he would have been a charlatan, not a spiritual teacher. Instead, what I think this “feeding of the multitude” is about is Jesus embodying a teaching: this is how it’s done. When the crowds are hungry and it seems there’s not enough to go around, that’s precisely when you truly need to bless, to share. Our instinctual inclination—especially in the midst of bleak economic circumstances—is to contract our circle of concern, curse the hungry masses and hang onto whatever we might have. Lean times can make for mean times. Or, they can make for the most miraculous times imaginable—when acts of selfless generosity turn the whole scarcity storyline on its head. It wasn’t long before the bus reached the stop where my dharma teacher and her husband were getting off. We wished each other well as we parted ways. But her teaching hasn’t left me: we’ve got to look out for one another. Will you accept that this the most perfect moment of your life? I mean, I’ve had plenty of moments that might be in the running for the most perfect of my life. The time I got to watch a meteor shower streaking hundreds of trails of light across the night sky. The first time I went snorkeling in the Carribbean and saw the spectacular world of coral and tropical fish. The times camping out in the Rockies under the canopy of the Milky Way. The bright September day of horseback riding in the Tetons. Not to mention all the times I’ve laughed with a friend over a cup of coffee, or witnessed a rainbow paint itself across stormy clouds, or wept while I listened to the last movement of Beethoven’s Ninth Symphony. I could go on with my litany of perfect moments, but I think you get the idea. 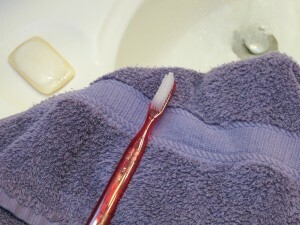 Brushing my teeth would never have made the list. But I suspect that was precisely the point. I wasn’t standing on a mountain peak looking out over a stunning vista. I wasn’t sitting in a concert hall listening to a breathtaking orchestral work. I wasn’t celebrating around a dinner table with good friends. I was doing something completely mundane that I do every single day of my life. The unbidden realization made me aware of how much I evaluate my experiences according to some scale in my mind about what constitutes perfection. Anything that doesn’t exhibit some extraordinary quality is not worthy of notice, and certainly not reverence. But there it was, this spontaneous teaching that has stayed with me ever since: This is the most perfect moment of my life. Since then, from time to time I repeat the phrase to myself. It almost always shifts my awareness. It opens my eyes to the absolutely amazing miracle of any moment, no matter how mundane it may seem. You just might try this teaching yourself and see what happens. While doing some mundane act say to yourself, “This is the most perfect moment of my life.” Repeat it until its truth finally begins to break through.